Almost 4 years ago, I wrote a short article on dumb websites who have a maxiumum password length. Now, in 2012, there are still websites with such stupid policies. One of the most famous is none other than Microsoft’s Live Account service, which serves as the authentication hub for all things Microsoft. 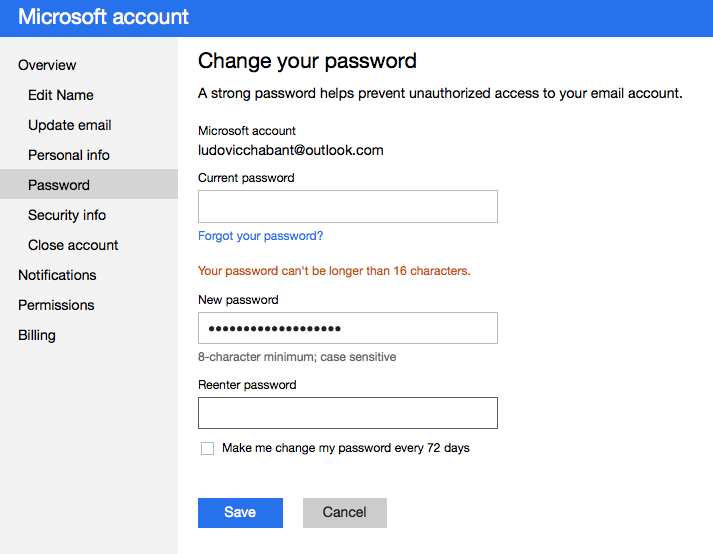 Basically, your Live ID, or whatever it’s called, can’t have a password longer than 16 characters. Microsoft is, rightly so, getting a lot of criticism about that because the recently released Windows 8 lets you link your Windows user to a Live ID, for use with the whole Windows App Store thing and more. This means, in most cases, that your Windows password can’t be longer than 16 characters, and, in other cases, that you have all kinds of weird account related bugs and you may need to enter a truncated password.